Alan Pardew has called on a near full-strength Newcastle United to make a statement about themselves at Old Trafford today. The Magpies have not beaten Manchester United on their own patch since 1972. But while the Red Devils are the reigning Premier League champions, their aura of invincibility is gone. The retirement of Sir Alex Ferguson has contributed and Wayne Rooney’s suspension, on top of Robin van Persie’s injury problems, only adds to that for today’s early televised game. Having beaten Chelsea and Tottenham Hotspur during a run of games that earned Pardew November’s manager of the month award and goalkeeper Tim Krul the players’ prize, Newcastle have nothing to fear. “It would mean a lot (to win today) because it would set the tone,” said Pardew. “To beat Tottenham, Chelsea and then Man U would say a little bit about the team. Whoever’s fault it is, Newcastle’s record is a source of frustration to supporters. Last year’s trip to the ground summed it up, finding the net three times only for Javier Hernandez to claim a 4-3 home win with his 89th-minute goal. Everton followed West Bromwich Albion as the second team to win in Salford this season, a result that sent David Moyes’ side to ninth in the Premier League, a point and two places below Newcastle. 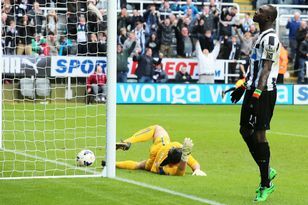 “I don’t think there is a psychological barrier,” Pardew said of Newcastle’s history against the Red Devils. “A lot of the people here are just not aware of that history and it has no impact on them whatsoever. The influx of so many international players from around the world and the market being so big is that we’re all attracting good players but I think the tactical awareness of the managers and coaching has got better, and improved to play against the top teams. There’s not so much fear as there was to play the top teams. As well as ending their four-match winning streak, Newcastle’s 3-0 defeat at Swansea City highlighted a lack of depth in Pardew’s squad. But with Steven Taylor recovered from injury and Hatem Ben Arfa from illness, Newcastle travel to the North West very close to full strength. Papiss Cisse and long-term absentee Ryan Taylor are Newcastle’s only concerns, and Ben Arfa, Massadio Haidara and Vurnon Anita could freshen the side beaten in south Wales. Taylor has not featured since his first-half red card in the opening game of the season at Manchester City. A hamstring injury has since seen Mike Williamson and Mapou Yanga-Mbiwa establish themselves above him in the central defensive pecking order. Shola Ameobi has started the last six games, but came off at the Liberty Stadium with a minor injury.